Designed by Aedas Arts Team, Tara Theatre in London, UK is the winner of the Culture & Community Category for Built Projects at the New London Awards 2017, beating fierce competition. 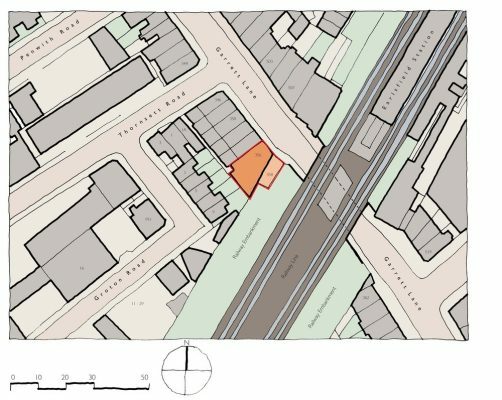 The project will be showcased along with other winning schemes at the New London Architecture Building Centre from Friday 21 July until Wednesday 4 October. 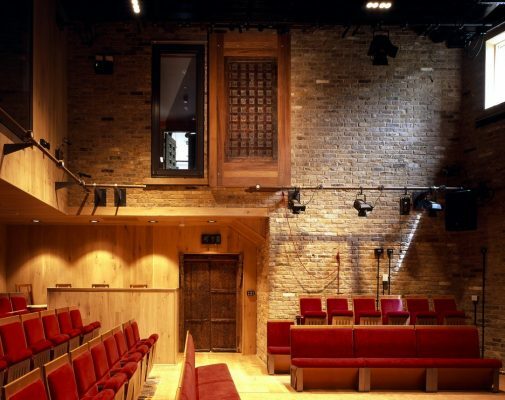 Executive Director Julian Middleton designed Tara Theatre as the new state-of-the-art home for the acclaimed Tara Arts, the oldest multicultural theatre company in the UK. Reopened in 2016, the new incarnation fuses the global and the local, creating an inspirational space for the country’s first cross-cultural theatre to create art from the dialogue between East and West. 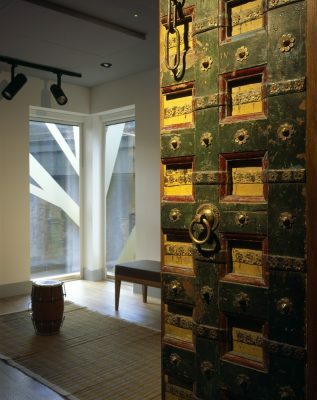 Oriental elements were integrated into the design to pay homage to the history of the theatre being Asian-led and owned – and to express the unique identity of Tara Arts in the English theatre landscape. The motif of the Banyan Tree refers to India’s ‘tree of life’ – and the shade it offers a place to meet as a focus of community life. ‘Tara’s Tree’ wraps around the façade. It invites audiences into the theatre to hear and share stories, whilst externally providing a lively and engaging urban marker. 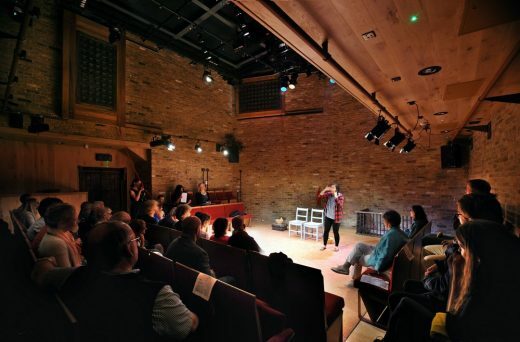 Tara Theatre features a superbly equipped and flexible auditorium with a doubled capacity of 100 seats, a new fully soundproof rehearsal room and other supporting facilities to fulfil the contemporary needs of performances and audiences. The performance space features an adaptable earth floor to offer an original, alternative surface as well as to give a tangible expression of Asian culture in London. 7,500 original bricks from the demolition were reclaimed and reused in the new auditorium, whilst materials were sourced locally wherever possible. The ‘Tara’s Tree’ on the façade is composed of 96% recycled ash. The internal spaces enjoy plentiful natural light with glare control by colourful window blinds. Unusual for a performance space, the main auditorium can be naturally lit through the high level windows. The New London Awards recognise the very best in architecture, planning and development in London, including both new and proposed projects across all sectors of the built environment, selected by an international expert jury. Tara Theatre in London, UK, designed by Aedas Arts Team, has won the ‘Project Design of the Year’ award at this year’s London Construction Awards. 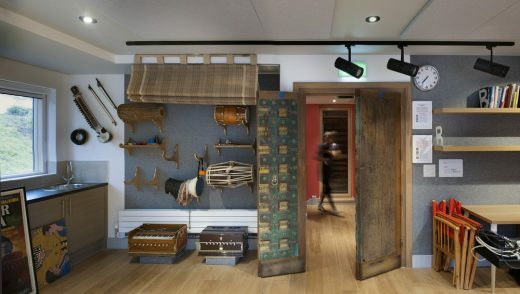 Recently reopened, Tara Theatre is the new state-of-the-art home for the acclaimed Tara Arts, the oldest multicultural theatre company in the UK. 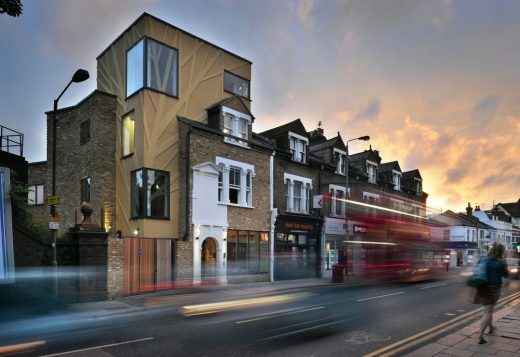 The new incarnation of Tara Theatre fuses the global and the local, creating an inspirational space for the country’s first cross-cultural theatre to create art from the dialogue between East and West. Oriental elements were integrated into the design to pay homage to the history of the theatre being Asian-led and owned – and to express the unique identity of Tara Arts in the English theatre landscape. The motif of the Banyan Tree refers to India’s ‘tree of life’ – and the shade it offers a place to meet as a focus of community life. ‘Tara’s Tree’ wraps around the façade and is pargeted, a traditional English craft, which resonates with Indian decorative techniques. It invites audiences into the theatre to hear and share stories, whilst externally providing a lively and engaging urban marker. The Project Design of the Year award celebrates projects that have been designed in such a way to be sympathetic to the environment and surroundings, functional for purpose and innovative in style.